Your support helps us empower at-risk males to become leaders in their schools and communities through dedicated mentoring—and to prepare them for their futures in the process. The Gentlemen of Vision Rites of Passage Enterprises, Inc. (GOV) is a 501(c) (3) not-for-profit organization. Donations are tax-deductible as allowed by law. Your tax-deductible donation provides opportunities for at-risk males to learn leadership and goal-setting skills so they can become positive role models to future generations. Our team performs throughout the community to showcase the step skills gained from membership in G.O.V. Performance schedules fill up fast - Book Us now! If you know of a young man in need of mentoring and the discipline that comes from being a part of a nationally recognized step team - Contact Us. "CHANGING LIVES of young men, ONE STATISTIC AT A TIME"
Gentlemen of Vision Rites of Passage Enterprises, Inc. (G.O.V.) was founded in 2009 by Mr. Marlon Wharton and the late Mr. Paul Albea on the campus of Riverview Gardens High School in St. Louis, Missouri. Both Mr. Wharton and Mr. Albea saw an increasing and alarming need to address the issues and concerns of young socioeconomically disadvantaged males. Mr. Wharton believes that there is a lack of counseling, academics, mentoring, and programs that specialize in fostering manhood among young males that would curtail the increasing dropout rate. The Gentlemen of Vision Rites of Passage Enterprises, Inc. is a community-based program currently servicing males from various school districts within the St. Louis Metropolitan Area. The organization has an impeccable 100 percent high school graduation and college admission/retention rate. Since 2009, every member has successfully completed high school and has been accepted into a college or university. In addition to servicing high school members, G.O.V. has extended its services to middle school Y.M.O.V. members, Collegiate members, and the GOV/NJROTC Drill Team. As the number of members and the demand of G.O.V. services increase, the organization has grown in staff and appointed a Board of Directors. The Gentlemen of Vision Rites of Passage Enterprises, Inc. (GOV), a 501(c) (3) not-for-profit organization, does not and shall not discriminate against any person on the basis of race, color, creed, or national origin. The vision of the Gentlemen of Vision Rites of Passage Enterprises, Inc. is to engage disadvantaged males in a positive program that holistically addresses the needs of its members to ensure successful completion of secondary education resulting in enrollment in a post-secondary educational institution. The mission of the Gentlemen of Vision Rites of Passage Enterprises, Inc is to prepare disadvantaged males to successfully complete high school through demonstrating superior leadership skills, academic excellence, community service, and career readiness in order to successfully transition into higher education or trade. 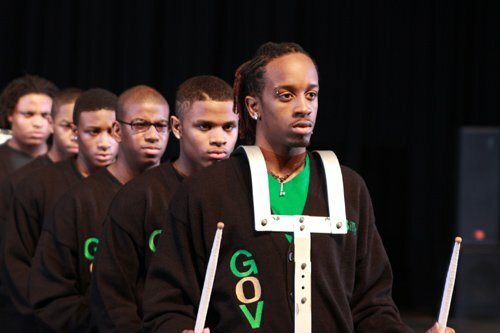 The Gentlemen of Vision organization was created to curtail the dropout rate among “proven-risk” high school males. In Missouri, the Black male graduation rate is 65.7%. To date, G.O.V. members have maintained a 100% graduation rate since the organization's inception in 2009. Thus the motto "Changing the lives of young men, one statistic at a time". Gentlemen of Vision supports high school males through community based mentoring, college / career readiness programs and volunteer activities that guarantee all members are socially and academically prepared for post-secondary experiences. Young Men of Vision engages middle school males in positive social and academic programs to ensure that all members will be socially and academically prepared for the high school level. Click here to get information on their Tumblr page.